Classic Film Watch follows festivals, screenings and events. Daily Posts Will Be Made From The Festival in Hollywood. Additional photos and detailed articles soon after the Festival will be posted on this website. classicfilmwatch.com is a non-commercial, film review and informational website. All photos or artwork, unless otherwise identified, are either in the public domain or believed to satisfy the four-point criteria of the U.S. copyright law for fair use. No infringement is intended. Photos and artwork are not used for commercial purposes. This is the theme of the 2019 and 10th annual TCM Classic Film Festival. TCM usually shows more than 80 films at their yearly Festival, so I think we can depend on there being many good films that are romantic in nature. Because of the large number of films shown each year, there has been good representation of all of the genres at past Festivals. I can't wait to see what the full line-up will be and I am especially interested in the silent films and foreign films. It's always a treat to see a foreign film on the big screen. It is especially rare to see a classic foreign film, but TCM manages to do this every year. I'm also interested in the documentaries about early filmmaking, which are always fascinating. There's much to think, talk, write and read about the upcoming Festival. Check back for updates over the coming months. To read about last year's Festival, click here. TCM has announced some of their special guests for the 2019 Classic Film Festival: Billy Crystal, Meg Ryan, Rob Reiner and Ben Model. Tony and Emmy Award-winning Crystal is a well-known comedian, actor, writer, producer and director. Ryan is best known for her acting in romantic comedies and she is also a director. While Reiner is remembered for his role in the 70s TV sitcom, All In The Family, he has since developed a successful career as a director and producer. The three will participate in a live conversation before the screening of their 1989 film, When Harry Met Sally. This screening will be the Festival's opening night Red Carpet event at the TCL Chinese Theatre IMAX celebrating the film's 30th anniversary. 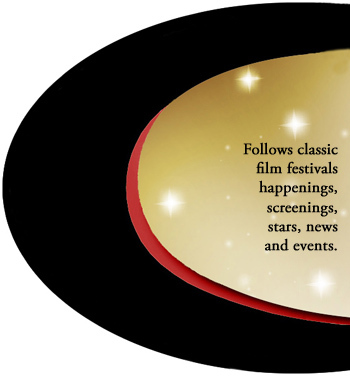 Watch for more announcements of special guests and films to be shown on TCM's festival website: http://filmfestival.tcm.com (under the Programs tab). Comedian, Actor and Author Billy Crystal will be honored during the TCM Classic Film Festival with a hand and footprint ceremony at the world-famous TCL Chinese Theater IMAX® in Hollywood on Friday, April 12. Crystal, a Tony Award® and six time Emmy® winner and Golden Globe® nominee, has had a remarkable career from starring in cinematic classics such as The Princess Bride (1987), When Harry Met Sally… (1989), City Slickers (1991) in addition to hosting the Academy Awards nine times (only Bob Hope has done it more). “Billy Crystal has long been among the most versatile talents working in Hollywood. And I say 'talent' because Billy is so much more than an actor. Trying to define his career into a signature role or moment feels futile. Is it his lead performance in When Harry Met Sally, the ensemble he led in City Slickers, or his scene-stealing supporting part as Miracle Max in The Princess Bride? Then again, it might be his prodigious resume of voice acting work or his consistently impressive work hosting the Academy Awards,” said Ben Mankiewicz, TCM primetime anchor and official host of the TCM Classic Film Festival. Crystal landed his first major television role in 1977 on the comedy series Soap, playing Jodie Dallas, one of the first openly gay characters on TV. In 1984, he hosted Saturday Night Live and a few months later joined the regular cast. His best-known SNL creation was Fernando, a talk show host whose tagline, “You look mahvelous!” entered the popular lexicon. In 2015, Crystal made his return to series television opposite Josh Gad in the FX series The Comedians. Crystal’s many feature-film credits include the buddy cop comedy Running Scared (1986), Rob Reiner’s comic fairy tale The Princess Bride (1987) and Danny DeVito’s dark comedy Throw Momma from the Train (1987). But his breakthrough role came in 1989 when he starred opposite Meg Ryan in Reiner’s When Harry Met Sally…, which became a romantic touchstone for a generation of moviegoers. Other iconic titles include Mr. Saturday Night (1992) and America’s Sweethearts (2001). In addition, he starred opposite Bette Midler and Marisa Tomei in the 2012 Christmas family comedy Parental Guidance, which he also produced. As a director, Crystal was nominated for both an Emmy and a Directors Guild Award for his direction of the 2001 HBO movie 61*, which told the dramatic story of the 1961 race between Mickey Mantle and Roger Maris to break Babe Ruth’s single-season home-run record. The recipient of the 2007 Mark Twain Prize for American Humor, Crystal has written five books, including Absolutely Mahvelous (1986) and 700 Sundays (2005) and two children’s books: I Already Know I Love You (2004) and Grandpa’s Little One (2006). Most recently, Crystal co-wrote, produced and starred alongside Kevin Kline and Annette Benning in Have a Nice Day, a play that was recorded live at The Minette Lane Theatre. It was released on Audible in November 2018 and became an instant bestseller. Crystal made his Broadway debut in 2004 with the original production of his one-man show 700 Sundays, for which he won a Tony Award. The Broadway production was taped in front of a live audience for an HBO special that aired in April 2014, garnering four Emmy Nominations. He lives in Los Angeles and New York with Janice, his wife of 46 years. Film Noir: Style or Story?